Top: the preproduction ROC Whiteout (right) compared to the POC version (left). 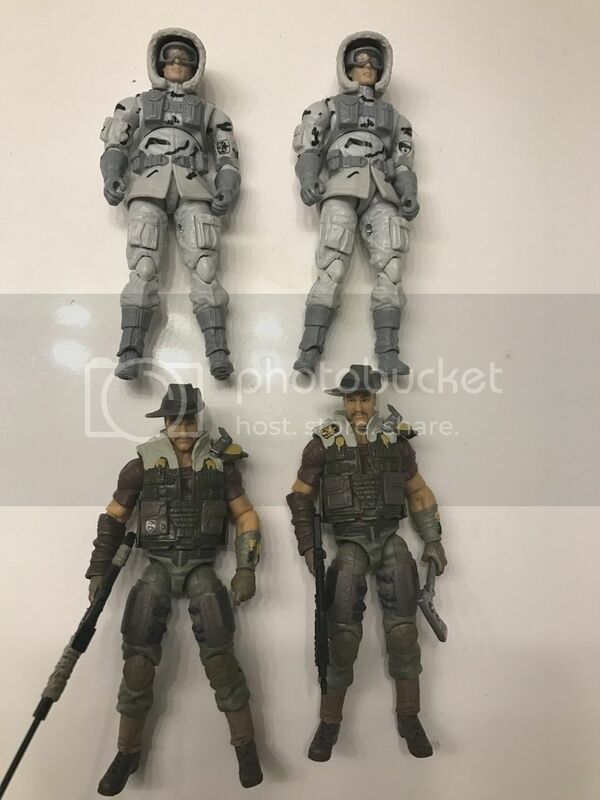 Bottom: the ROC Recondo (this time on the left) compared to the POC version (right). For both of these, the only real difference is the different logos. The cancelled ROC desert Heavy Duty. 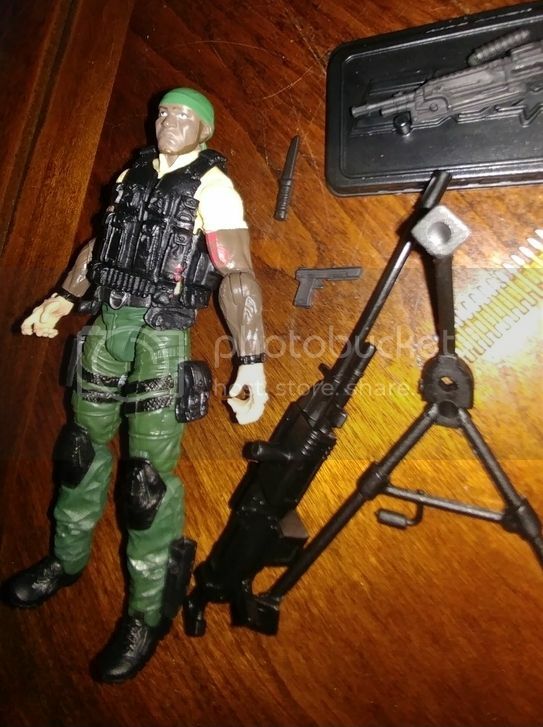 This figure has two holes on the top of the vest for the missile launcher to fit onto (the two pegs can be seen near the handle). The ROC Snow Job. Note the ROC logo on the skis (the production POC figure has no logos on the skis). The cancelled ROC Elite Ice Viper (right) next to my cancelled 25th Arctic Scarlett (left). Note that some of the gear for each figure has been omitted for this picture. My Jurassic Park items. 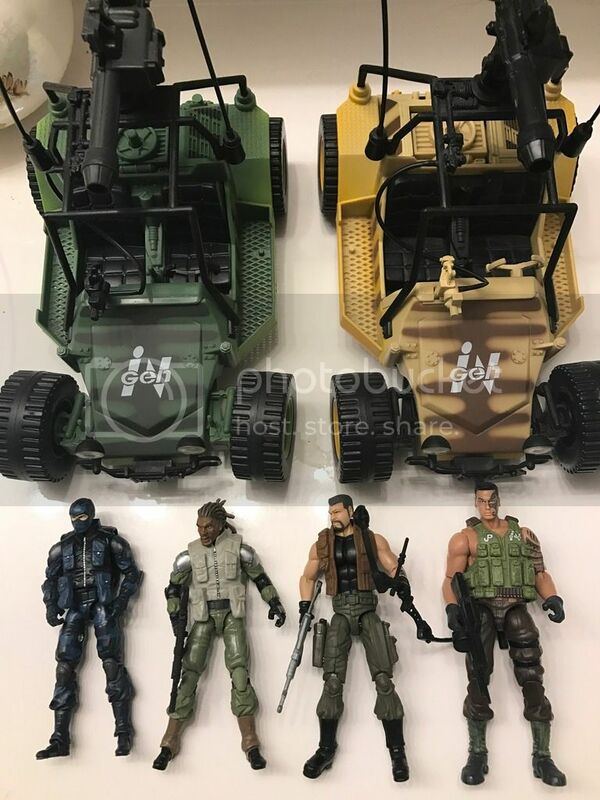 The blue figure on the far left goes to the green Awe Striker above him. I am missing the green driver to the yellow/tan Awe Striker on the upper right (if anyone has one they'd sell, let me know!). The very common Maori figure is on the far right. The two center figures (Gunner Gordan (center left) and Ash Striker (center right)) were both eventually released. 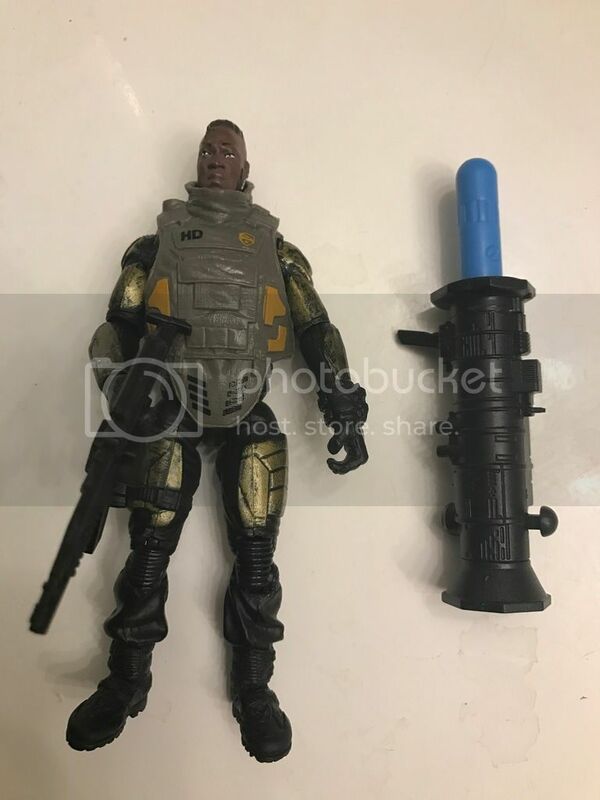 The preproduction of the POC Firefly (left) with his gear, compared to the released version on the right. Note that in addition to color differences throughout the figures, the backpacks are also painted differently. The released figure also did not come with the suction cups. 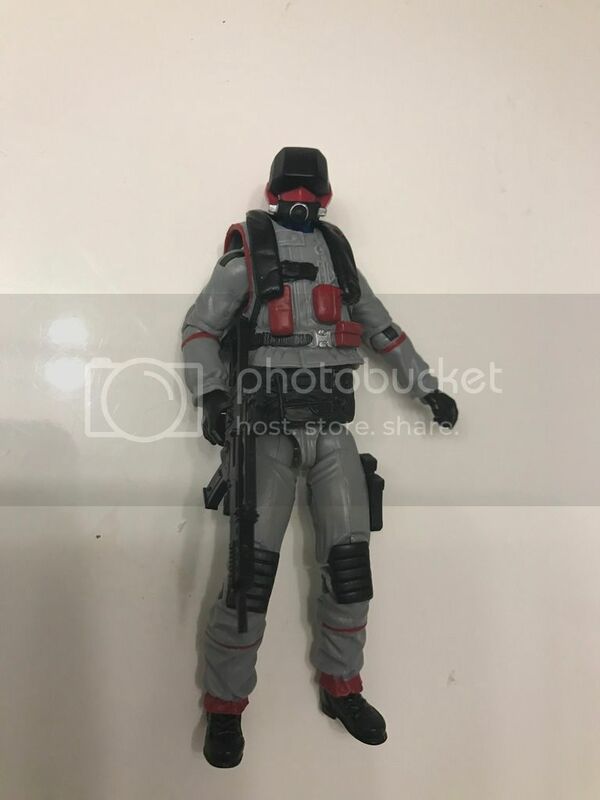 A better image of the 50th Air Viper preproduction figure showing the black rivets in the arm and missing gold cobra symbol on the right arm. This figure is also missing a paint application on the back (a blue strap, not pictured). 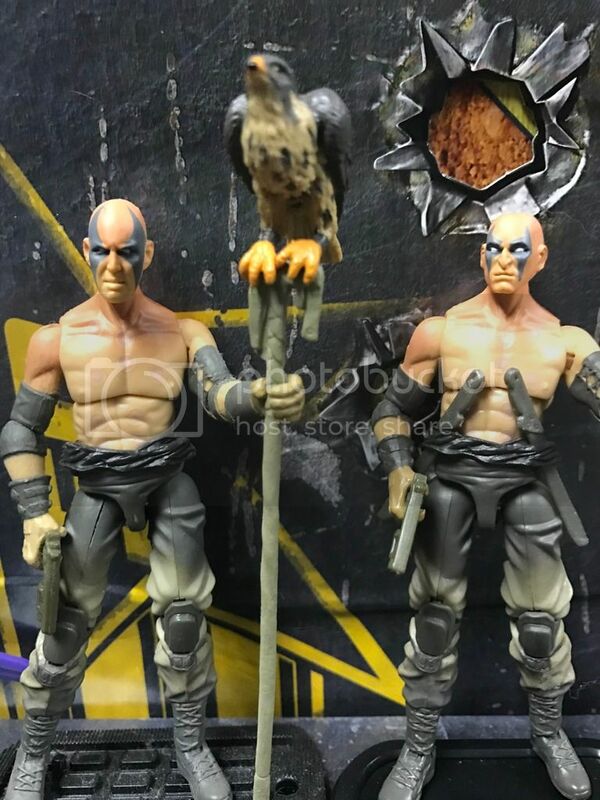 I didn't feel this was different enough to be considered a separate preproduction figure (so it is not in the list), but I think it is interesting nonetheless. 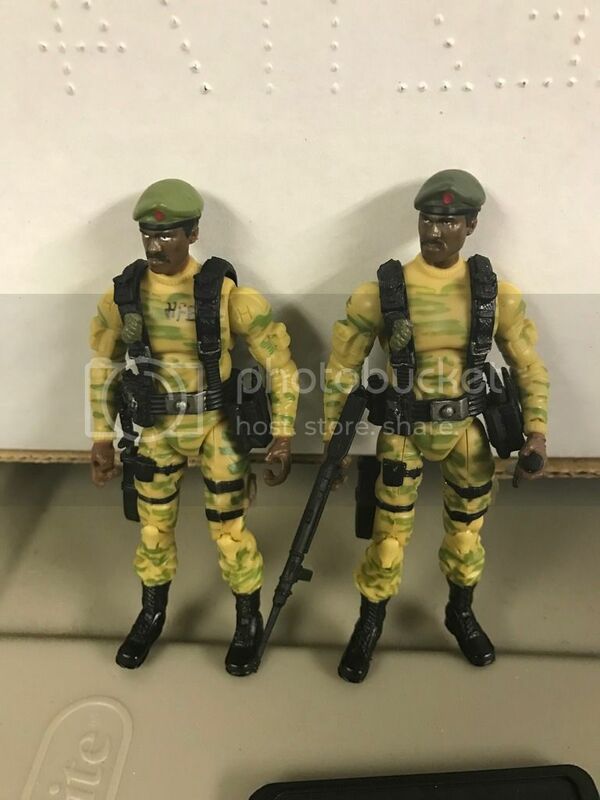 Here is a preproduction yellow Stalker from the 25th line (left) compared to the released version on the right. 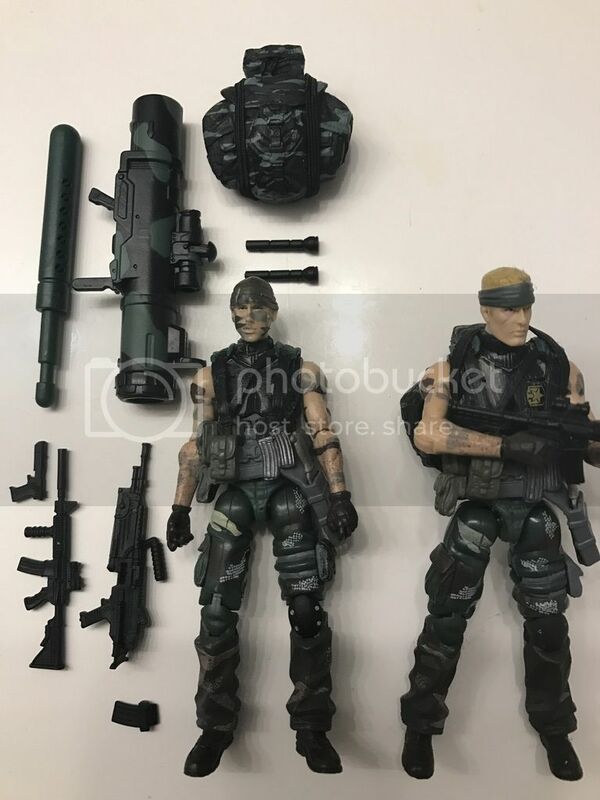 In addition to the Hasbro markings, the head of the preproduction one is hand painted and the colors are not quite the same, especially the beret which is significantly lighter in color. Last edited by Dem_Yoe'z! ; 12-23-2016 at 05:01 AM.. I'll post some other goodies once I get home !! 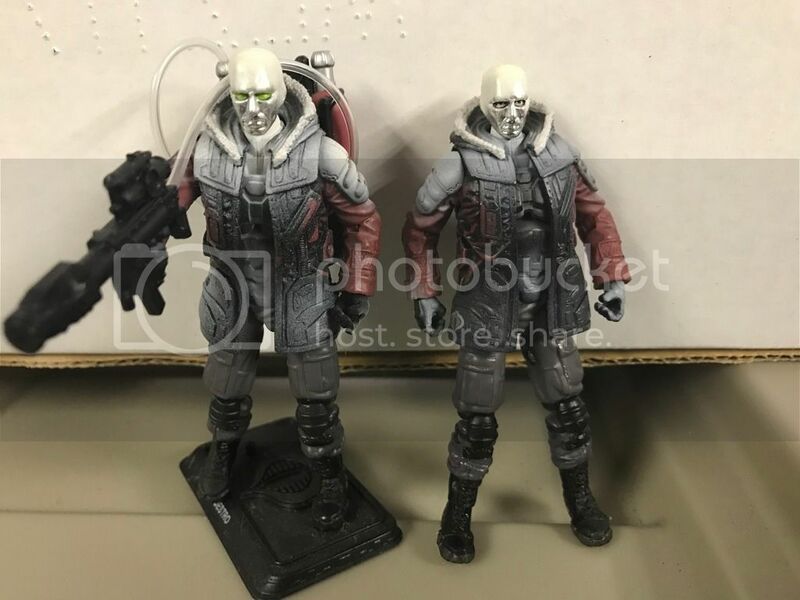 The cancelled ROC Arctic Destro (right) compared to the released POC version (left, with gear). 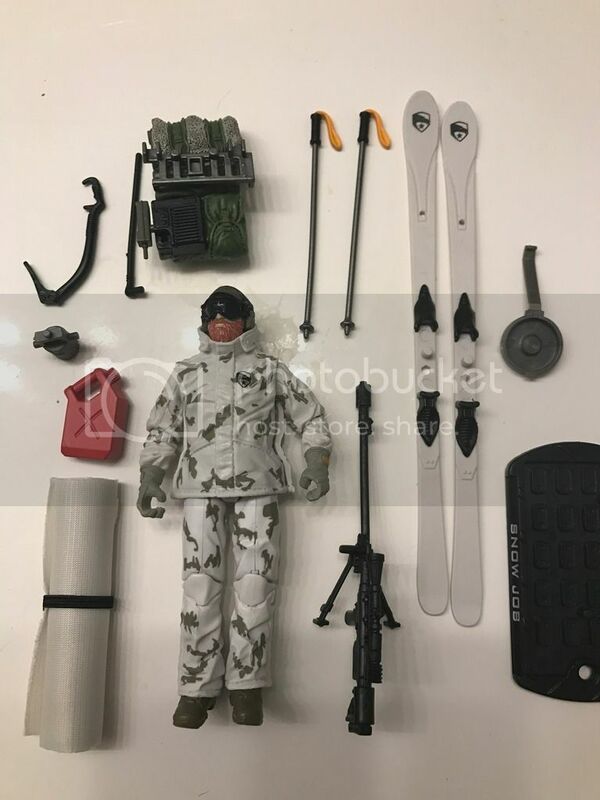 Note the cobra symbol visible on the lower right side of the figure's parka and the visible eyes on the ROC version (the head is actually the same mold). 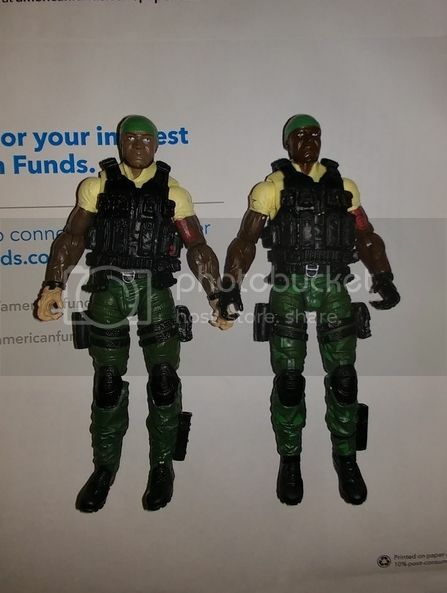 The cancelled ROC Zartan (left) compared to the released POC version (right). The ROC figure has a completely different head that is much longer. 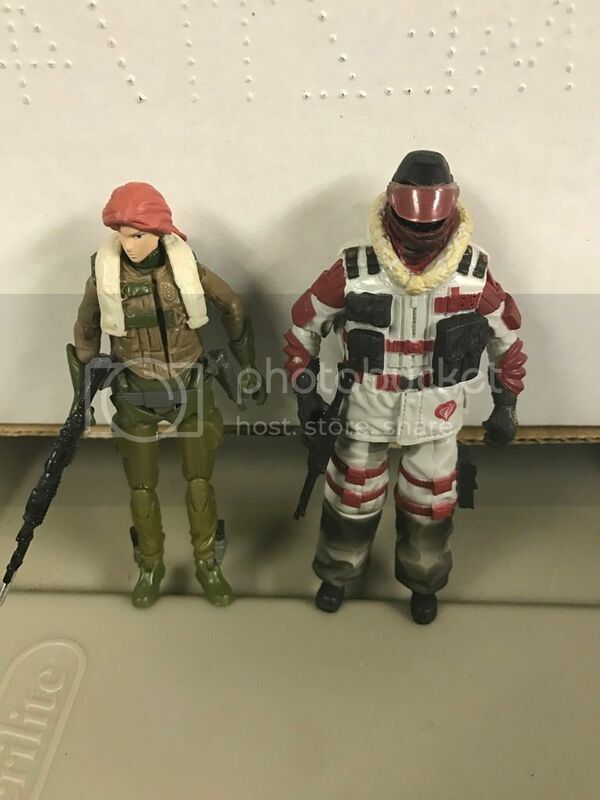 Here is an image of Arctic Scarlett next to a prototype of the 25th single carded Lady Jaye (which is where Hasbro took the legs and feet from). 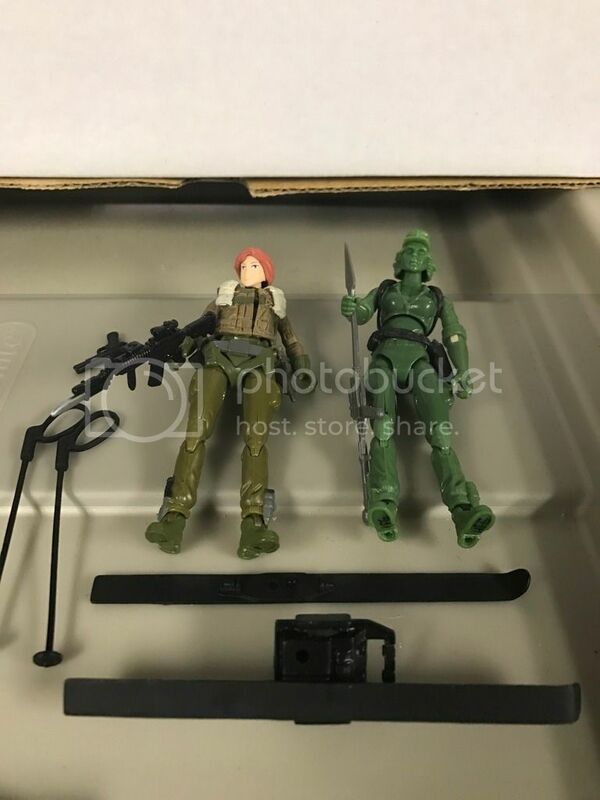 Note that on Lady Jaye, the peg holes are in the heel, while on Scarlett they have been moved to the center so the skis fit on her. The earlier brown Arctic Scarlett (see Firefly's image) still has the peg holes in the heel. Here you can see the side of the figure's face with the much darker skin tone showing (looking like the figure is wearing mascara). Oddly the released figure still has this, but because the skin tone is so much darker, it is closer to the darker color on the head and not nearly as obvious. The preproduction figure (left) compared to the released version (right). Note the much lighter skin tone, and the tattoo overlap onto the lower left side sleeve on the preproduction. 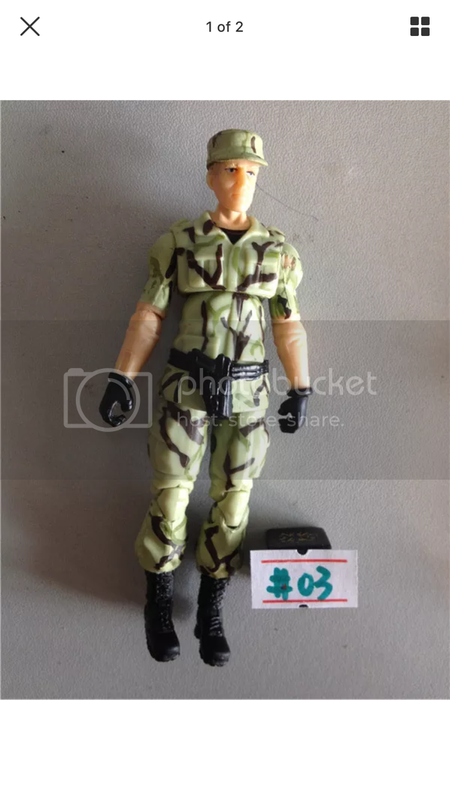 The tan gloves on this variant of the figure are the result of them not being painted. Last edited by Dem_Yoe'z! ; 12-23-2016 at 05:04 PM..
Update: Iron Klaw and Crimson Guard confirmed exist! 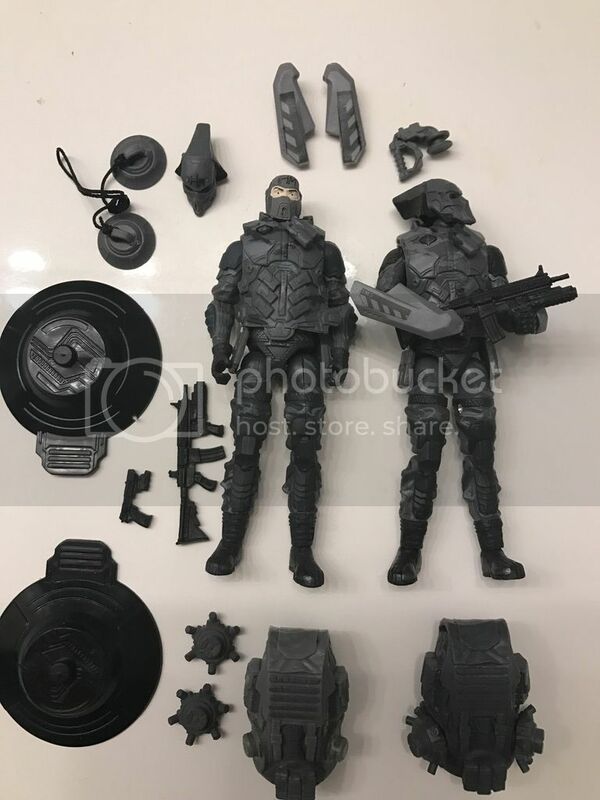 Image of the preproduction ROC Pit Trooper in lighter color plastic from an auction I unfortunately missed. 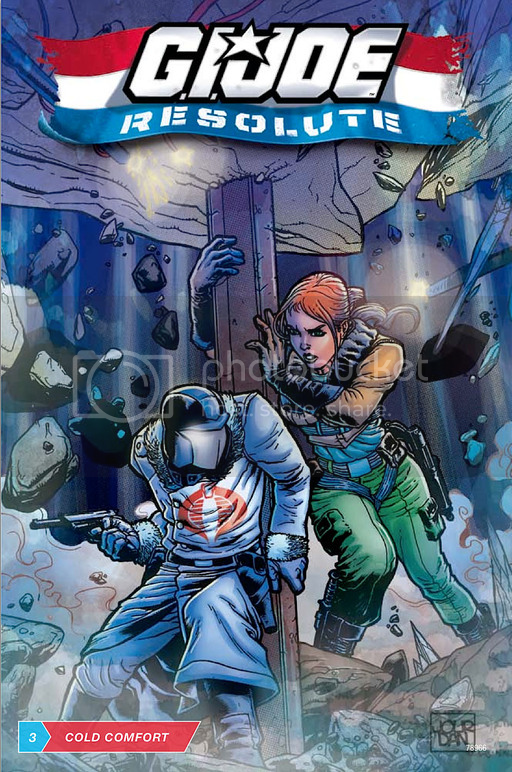 This is an image, originally from the internet, of the front of the comic book that was supposed to come with the cancelled 25th Arctic Cobra Commander and Arctic Scarlett. It is unknown if this comic was actually produced and what the content of it was. Last edited by Dem_Yoe'z! ; 12-25-2016 at 02:35 AM..